I’ve eaten — and even mildly enjoyed — a couple of meals that bear a trace of FLAVOUR. I’m sitting on the computer typing this instead of lying on the couch, even though I’ve been mostly upright all day today. I went grocery shopping by myself this morning. And I actually bought food. That I can imagine eating. Hopefully in a couple of weeks I’ll be back in the derby saddle and moving forward on the project. The other night I experienced my first real night of crazy pregnancy dreams, and in one of them I discovered that all my best derby pictures were behind me. None of the set-ups I was trying really worked and I didn’t know what to do. I woke feeling determined not to let that come true. I’ve actually gotten some pretty positive feedback from the industry on the series. 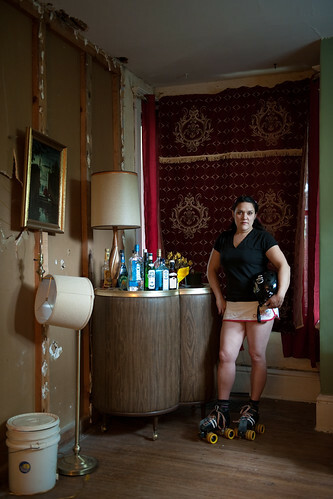 The Center for Fine Art Photography just opened New Normal on Friday, and my portrait of Leigh-zzie Border is in it! New Normal addresses the evolving ideals of social relationships, ecological engagement, media and culture in our ever changing world. There’s some really great and intriguing work included, and Edward Robinson is the Curator of Photography at the Los Angeles County Museum of Art so it’s pretty huge to me. I also submitted work to RMG Exposed, a juried competition to raise funds for the Robert McLaughlin Gallery in Oshawa, and my image of Inna’ Goddess Da-Vida at the piano is a finalist. The finalist pieces are donated to the gallery’s silent auction on November 13. You can see the finalist images online, and my image was even posted on the Photo Life blog. Oshawa’s very close to where I grew up — in fact I often went out in Oshawa when I was a teenager and home from university on holidays — so I’m planning to go the auction. Having my work hang in a public gallery is pretty cool — even if it’s just for a few nights. So. Now you have all the news.